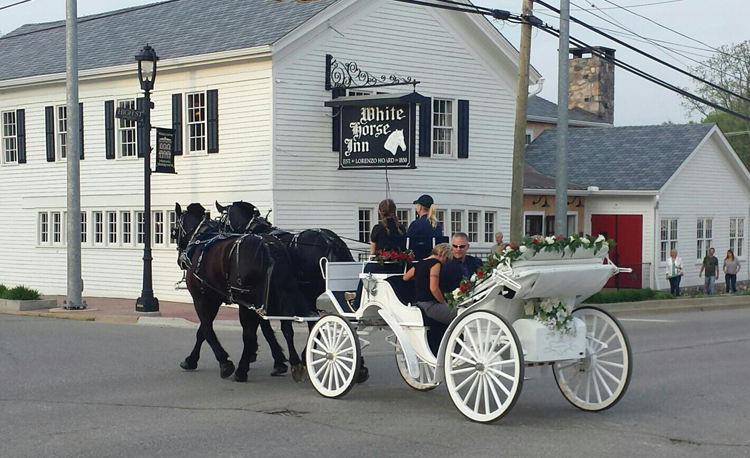 If you’re already taking the time to dine at the White Horse Inn, add at least an extra hour. You’ll need it to tour the painstakingly detailed renovations of the 1850s inn. Plus, you’ll want to sightsee among the churches, storefronts, homes, and farms of Metamora, a quaint village of around 565 people. Two of those people are Victor Dzenowagis and Linda Egeland, the couple who saved the inn after the previous owner gave up in 2012, ending the run of what was Michigan’s longest continually operating restaurant. The legendary spot had been a stagecoach stop, a hotel, a brothel, and an Underground Railroad station. Renovation took some heavy lifting (and just north of $3 million, about a third from grants), but in late 2014, the inn was back up and running. 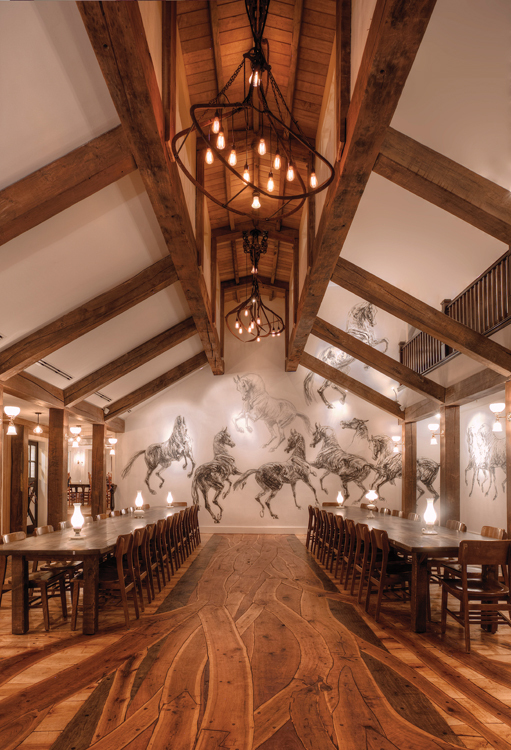 The decor honors an equestrian theme, including a fresco by a French artist. 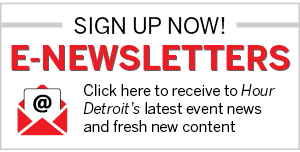 There’s also a stone fireplace and an inlaid wood floor shaped like a tree (for more on the renovation, see January 2015’s Hour Detroit or visit hourdetroit.com and search for “Back in the Saddle”). Dzenowagis admits the project was a gamble, but then again, why not bet on yourself? He and Egeland do have a few years’ experience — as in nearly 30 of them. The couple met while working at Dooley’s in East Lansing when they were students at Michigan State University. They started Beaver Creek Tackle & Beer in Westland in 1990, and after a bit of success, kept on going. Their operations include The Moose Preserve Bar & Grill in Bloomfield Hills, Camp Ticonderoga in Troy, Deadwood Bar & Grill in Northville, and The Iroquois Club Fine Banquets in Bloomfield Hills. So why take on another place? The couple lived in Metamora and, as Dzenowagis told the National Trust’s Preservation magazine, he didn’t want to see the inn torn down in favor of a car wash or (the horror!) a chain restaurant. So far, the gamble has paid off. “It is hard to believe we’ve been open almost two years,” Dzenowagis says. “Business has been really good and continues to develop in interesting ways.” A recent weekend included wedding receptions, a funeral, and a baby shower along with the regular restaurant traffic. The menu boasts “upscale comfort-casual fare.” Appetizers include mini panko-crusted Reubens (aka Blarney Stones) and house-made pickles with beer cheese bread. Cowboy Mac and Cheese is loaded with pulled pork and topped with candied bacon.There’s Chicken Pot Pie and “Buffaloaf” (meatloaf). Hitting even closer to home is Elvira’s Hungarian Goulash, a beef, Worcestershire sauce, brown sugar, and paprika dish served over egg noodles. The award-winning recipe was nabbed from Egeland’s mother, who took the 1964 Mrs. Michigan crown. 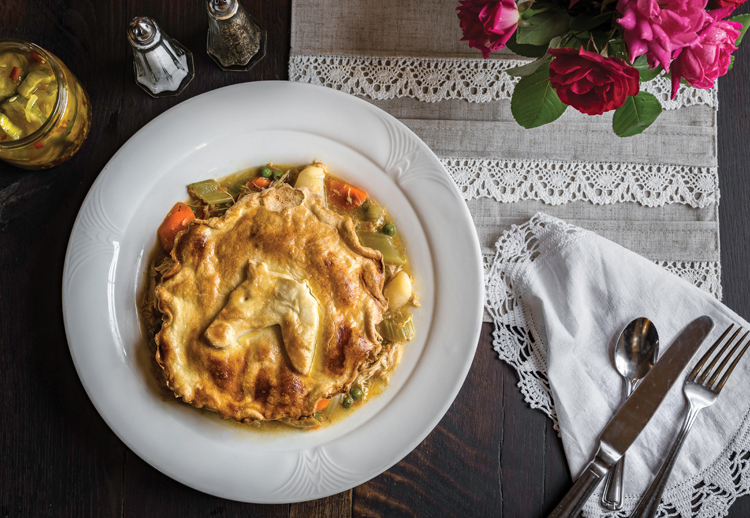 The White Horse Inn has become a base of operations for the couple’s other restaurants, including a test kitchen overseen by Egeland. The signature goulash is one dish shared periodically as a special at their other places. It was so hearty, we sadly passed on the tempting dessert fare that included oatmeal pie with Michigan maple ice cream and a warm bread pudding. Next visit, we’ll save room. After all, a carriage ride in a Christmas-card setting followed by a plate of made-to-order chocolate chip cookies? Now that’s a comfort food finish. 1 E. High St., Metamora: 810-678-2276. L & D daily.